Dive into oceans of fun for kids! 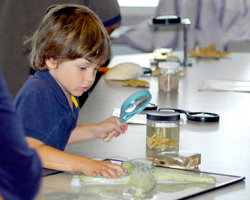 Sign up for Cabrillo Marine Aquarium's spring and summer programs. We are looking for volunteers who enjoy spending time outside, care about the environment and are interested in educating others about our coastline. Fifth grade students through adults who would like to make a difference are invited to apply. Training starts April 26. Learn more! Starting in June, we host a variety of classes for students ages 3 to 18 throughout the summer. The complete class schedule is available on our calendar. Learn more! Learn about ocean animals and practice public speaking! Summer docents provide tours to groups visiting the Aquarium. Students entering grades 7-12 in the fall may participate in the program. In addition to mandatory training and volunteering, optional field trips and wrap-up parties are part of the fun. Learn more! 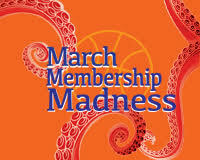 It's March Membership Madness! Become a NEW member during March and be entered to win two tickets to the Grand Grunion Gala: Cinco de Mayo Fiesta - a value of $450! Members also receive discounts on summer classes. Become a member!